From bamboo to LED lamps, “green design" has been a key trend in recent years. Now, in a twist on that theme, some designers are turning to trash for components of high-end tables and chairs. Among the materials popping up in pricey furnishings: old billboards, bicycle rims and detergent bottles. Environmentally friendly materials have been growing in popularity for some time now. But much of that focus has been on sustainable materials that look like their more expensive counterparts—bamboo flooring as an alternative to oak, for example. Katherine Burson, a professor at the University of Michigan's business school, says buying barstools fashioned from old bicycle rims helped “cleanse" her conscience. After a renovation last year, Burson felt guilty about not reusing all the old oak flooring from her 1970s Ann Arbor ranch home. But, she admits, the main appeal of the $500 a piece (approx. Rs19,000) stools is aesthetic. “It's more like art" than furniture, she says. “It's the one thing that everyone mentions." Some makers who use recycled content say their products last as long as those made from traditional materials such as wood or stone. California furniture designer Whit McLeod, who makes oak flooring out of used wine barrels, says barrels withstand moisture because they have already been “seasoned" by Merlot and Cabernet Sauvignon. But there are some drawbacks. Robert Bristow, creator of Poesis' waxed-newspaper-pulp furniture, says he is not sure whether one of his chairs could withstand being placed too close to a fireplace. Though high-end furniture prices often reflect the cost of materials such as mahogany wood, shoppers cannot necessarily expect a discount for pieces made of recycled materials. 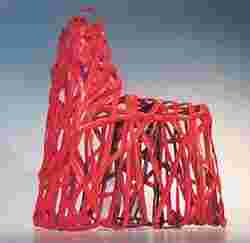 British designer Richard G. Liddle sells a plastic chair made from milk and laundry detergent bottles for $630. He says the price tag is high because of the expense of the machinery needed to melt and process the plastic. Liddle says he also crafts each chair himself, and so, no two are alike. In California, Vetrazzo creates mosaic-like countertops using glass from old traffic lights and Skyy vodka bottles. To secure the red glass for Vetrazzo's “traffic-light red" series, the company tracked which American cities were switching from glass to lower maintenance plastic lenses in their traffic lights, then struck deals to collect their red lenses. The company has enough glass left for 250-300 more panels, says president James Sheppard: “When we run out, we run out."